After driving up early in the morning as usual, I parked the car at the Waterville Valley Ski Area and we started up the Mt Tecumseh Trail around 7:15 AM. The day began clear and cold, about 8 degrees, and was quite windy up high, but we were mostly in the trees, so it wasn't really an issue except for a short time at the top. 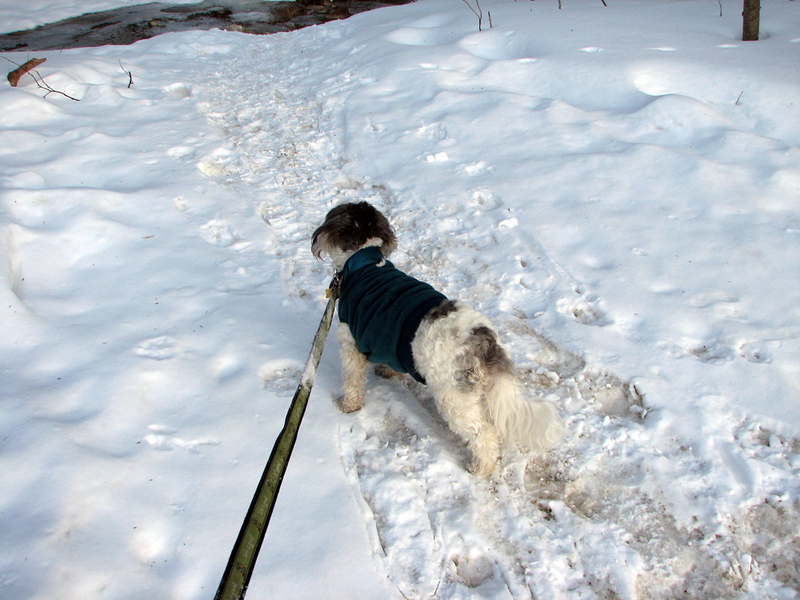 At the trailhead, we stopped before crossing a small brook so I could put on my microspikes. 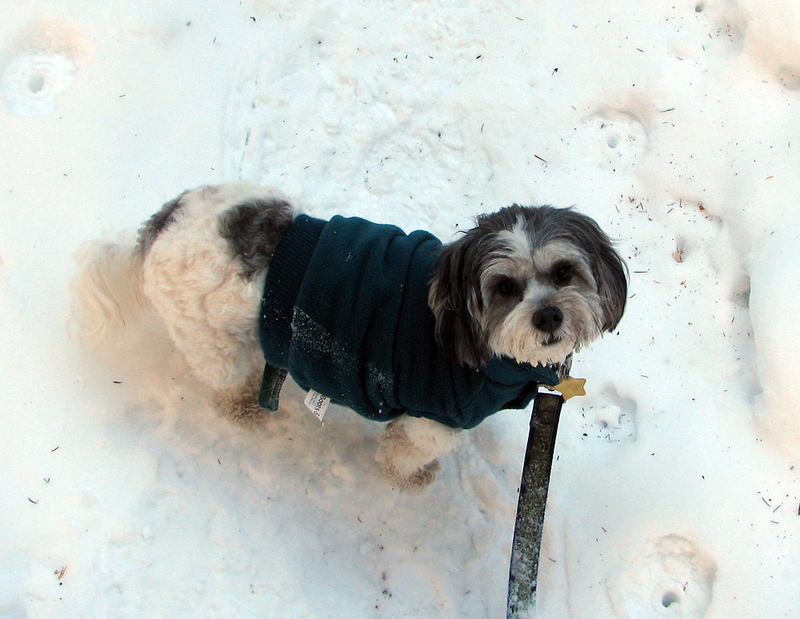 Patches was wearing a green fleece that seemed to keep her comforable. 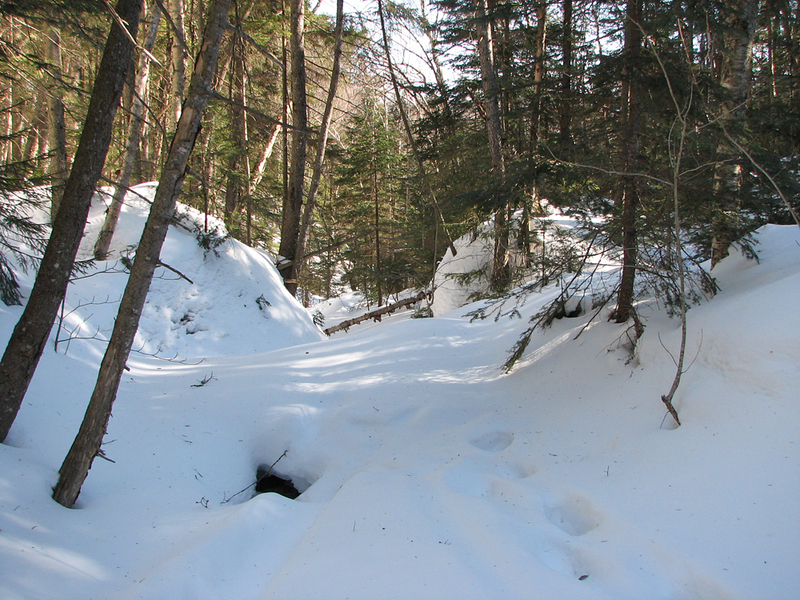 According to White Mountain Guide Online, the first part of the trail had been rerouted due to damage from the tropical storm in 2011, but it wasn't obvious, especially with all the snow on the ground. The going was pretty easy as the trail was well packed and the grade was mostly gentle to moderate until we crossed a deep, steep-sided ravine. 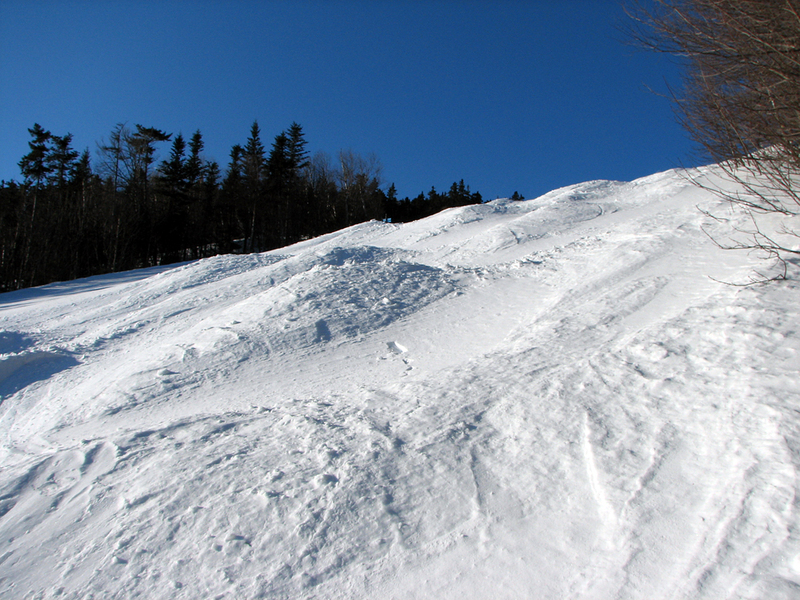 At the top of the climb out of the ravine, the trail passes within a few feet of one of Waterville Valley's ski trails. Here, at the view sign, we took the slight detour to enjoy the view east toward the Tripyramids. I also took a couple of pictures of Patches, but never got her to look directly at the camera. Beyond this point, the trail follows a fairly straight path along the south side of the brook at a moderate and even grade which at times seems to go on endlessly. Patches kept hearing noises from the snow grooming machines at the ski area, but since she couldn't see them, she kept looking around to make sure they weren't coming up the trail in back of us. Closer to the ridgeline, the trail became much steeper and narrower, and my pace slowed to match it. Patches was mostly in front of me and seemed to wonder why I couldn't go any faster. Finally, the trail leveled out, and soon afterward, we arrived at the Sosman Trail junction on top of the ridge that connects Mt Tecumseh to the top of the ski area. We stopped here for a short rest and for me to take another picture; this time, I managed to get one of Patches looking at the camera, although I did have to tie her to the trail sign to keep her from following me as I stepped back a few feet. 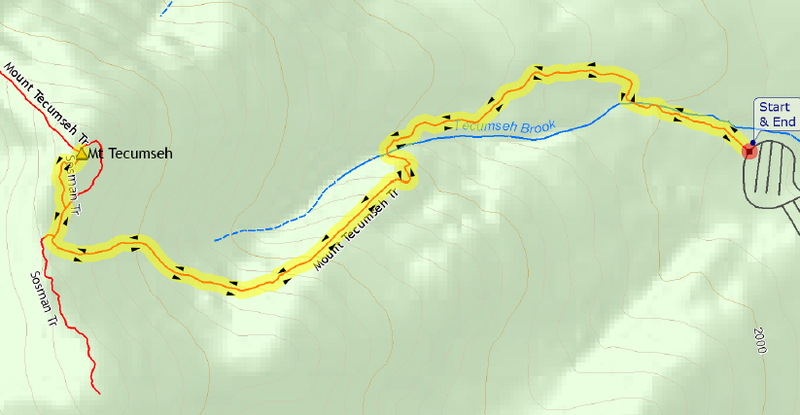 From here, the Sosman Trail follows a short fairly level stretch north until the trail splits into two branches. Here, the Sosman Trail veers to the left to climb the west side of the summit cone, while the Mt Tecumseh Trail bends to the right to ascend the steeper east side. I chose the west branch since I knew that the other way tended to accumulate large drifts. 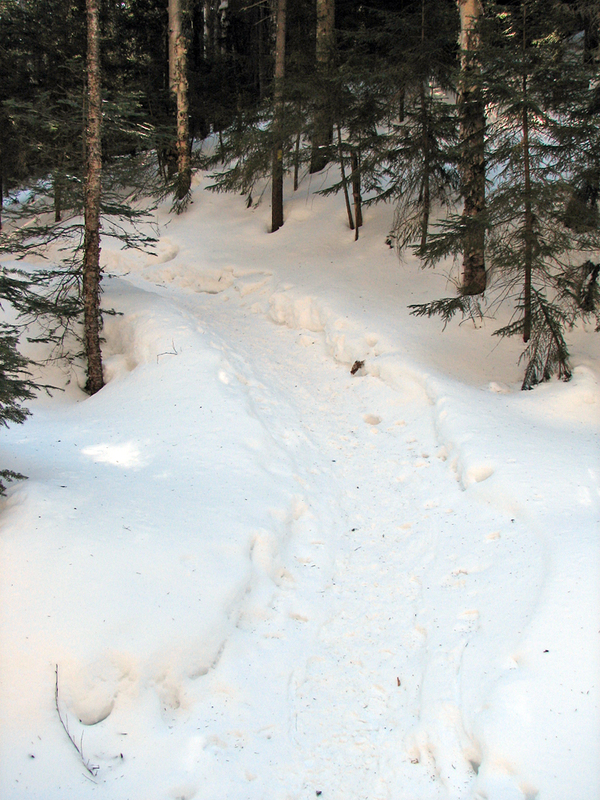 The trail climbed by switchbacks, with alternating steeper and more level sections. In a couple of spots, small drifts had formed but they weren't an issue. 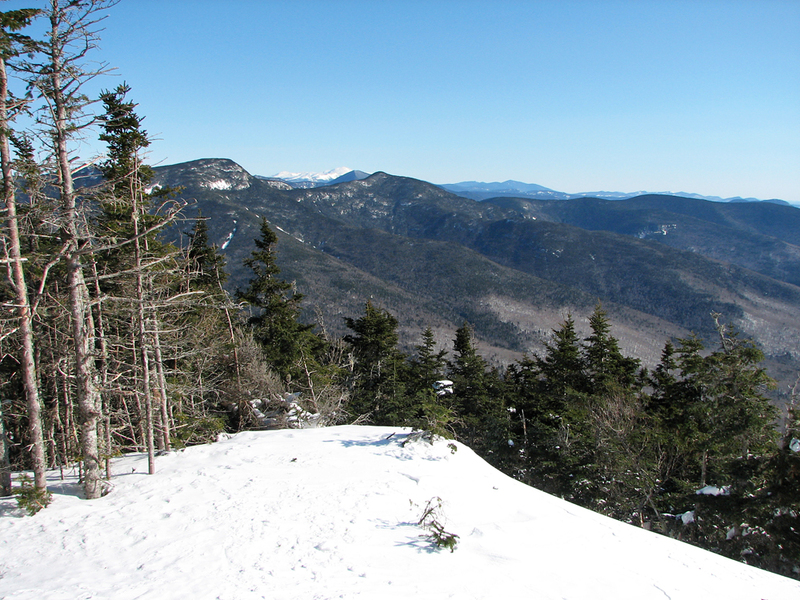 Just before the final approach to the summit, there's a view off to the west where I could see Mt Moosilauke's broad snowy summit. Not far beyond, we climbed one last pitch to Mt Tecumseh's summit. This was Patches' sixth four-thousand footer! I leaned my poles against a tree and we descended a few yards to a northeast viewpoint overlooking the Osceloas, Mt Carrigain, and the distant Presidentials. The view seemed better than I remembered; perhaps the 2011 storm blew down some of the trees. The summit was fairly windy and much colder than it had been a bit further down. I tried to take a picture of Patches and me sitting together by the summit cairn, but the camera must have been zoomed in and all I got was a picture of part of my face. It was way too cold to keep on trying; Patches was beginning to shiver, and my mittenless hand was starting to feel numb, so I put my mitten back on and we headed quickly down to get back into the shelter of the trees. We stopped for a rest just below the Mt Tecumseh/Sosman Trail junction where I had taken Patches' picture earlier. We were much warmer now and ready for a snack. Normally, I like to eat something on top, but there was no way we were going to linger up there today. I gave Patches a couple of plastic tubs of dog food and she gobbled them right up. I had my usual power bar and some potato sticks. We made really good time descending on the smooth packed trail, and it wasn't long before we reached the viewpoint by the ski trail again. Now that it was later in the morning, the ski area was open and the snow grooming machines had stopped running. 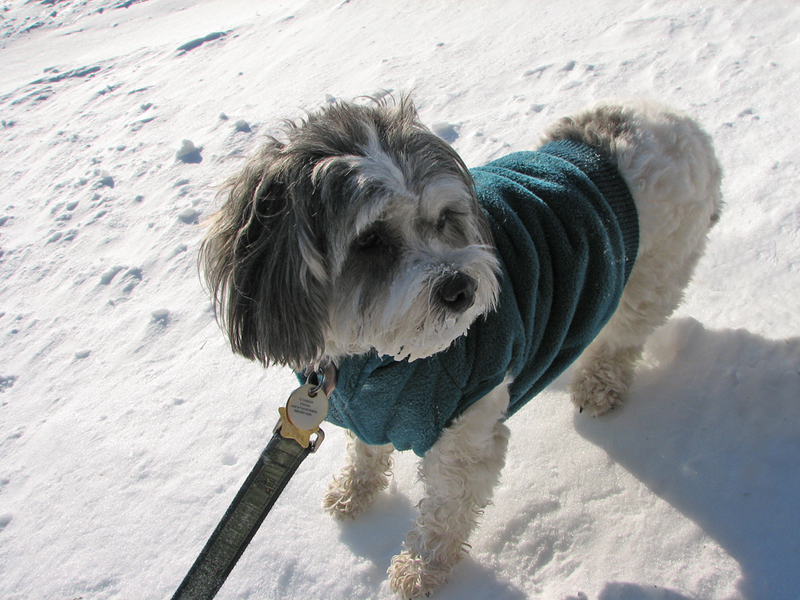 But for the last ten minutes or so, Patches had been hearing the sound of people skiing, and kept wondering what it was. At the viewpoint, we stopped for a couple of minutes so I could show her what was making the noise. Soon, several skiers and a snowboarder passed by. Since they were all wearing helmets, I'm sure Patches had no idea who or what they were; for all she knew, they could have been aliens with strange-looking long feet. But at least she now knew where the noise was coming from. After getting back in the car, we stopped at Waterville Valley village and I went into the shops to get a soda and a sub. Before leaving, I took one last picture back up to the ski slopes and the Mt Tecumseh summit cone. View east from the ski trail. 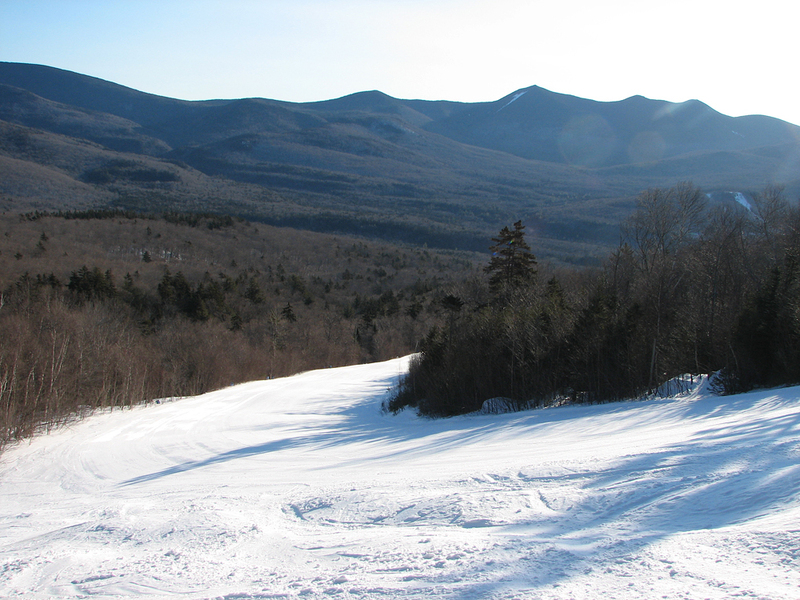 After crossing a deep ravine, the trail passes within a few feet of a Waterville Valley ski trail. The three peaks in the distance are the Tripyramids. Looking uphill at the ski trail. Since it was only 7:45 in the moirning, there weren't any skiers yet, but we had heard the snow grooming machines while hiking up the trail. Patches looking back toward the Mt Tecumseh Trail from the viewpoint on the ski trail. 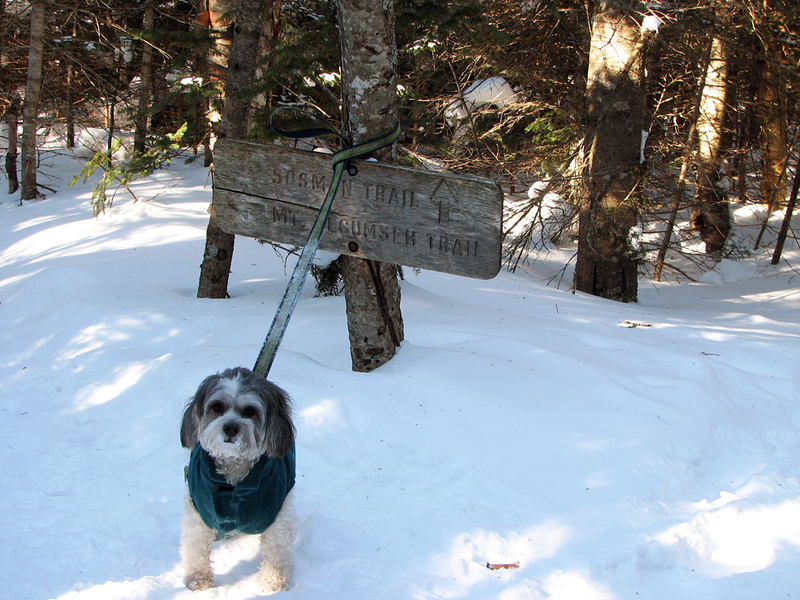 Patches at the Sosman Trail junction. Near the ridgeline, the snow was much deeper as you can tell by how low the trail sign is. View northeast from the summit. 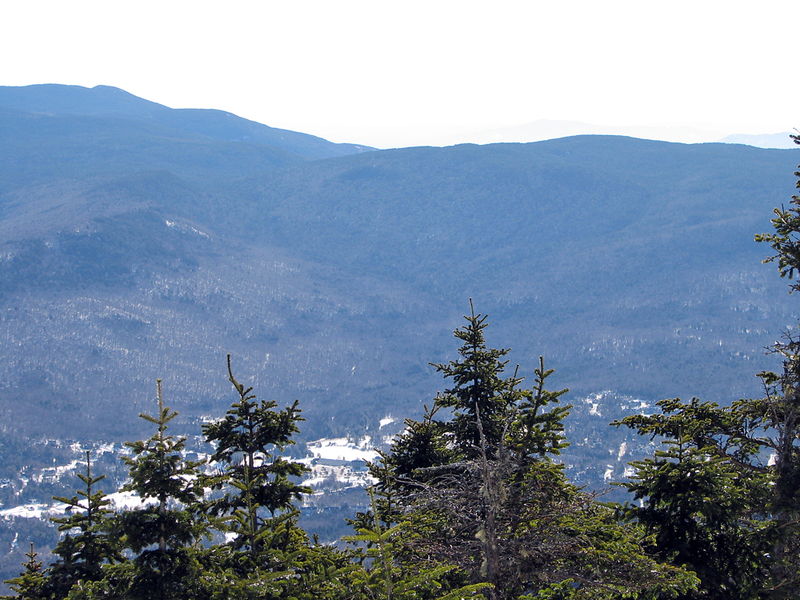 Mt Washington and the Northern Presidentals are visible in the distance. Zoomed-in view to the northeast. Mt Osceola and East Osceola are in the foreground. 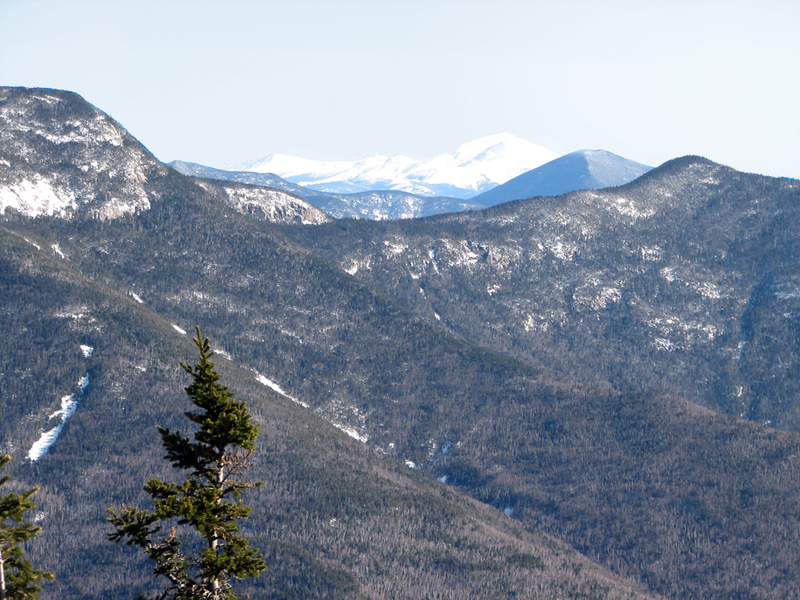 Behind East Osceola is Mt Carrigan, and behind that are Mts Washington and Jefferson. Closeup of Mts Carrigain and Washington. 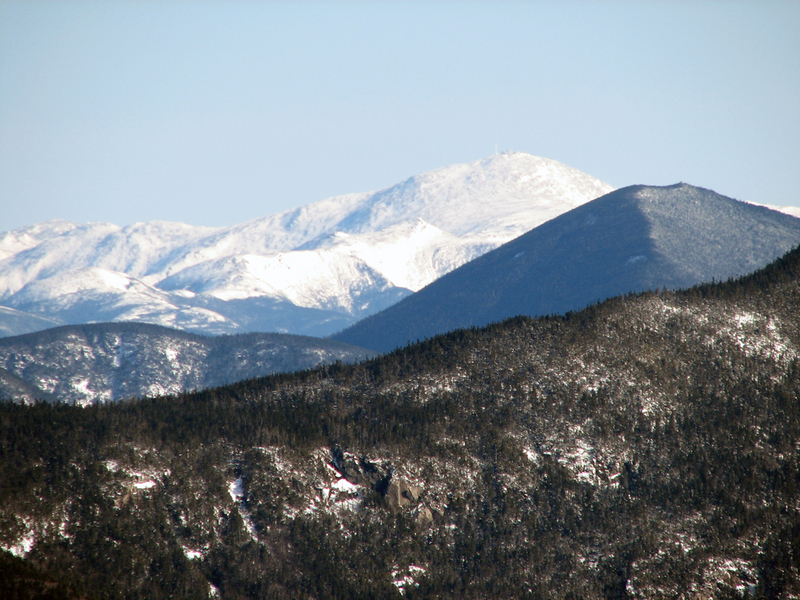 The boxy shape of the Mt Carrigan lookout tower is just visible on the right-hand prominence. Looking down on the village of Waterville Valley from the summit of Mt Tecumseh. Snow-covered Tecumseh Brook at the lower crossing. Looking down the Mt Tecumseh Trail, as we were getting close to the end of the hike..
Patches on the lower part of the Mt Tecumseh Trail. She might be thinking, "Do we have to get back in the car?" 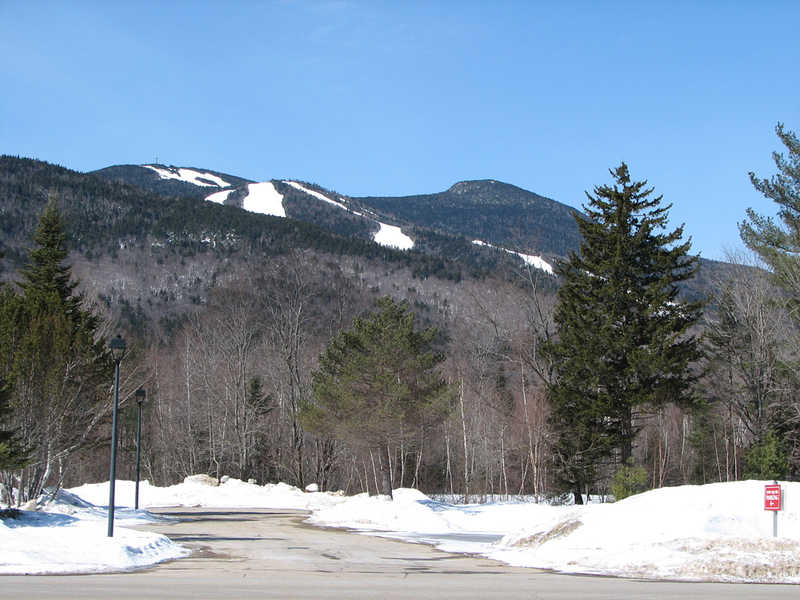 Waterville Valley Ski Area and the summit of Mt Tecumseh from Wateville Valley village.